A site specific installation for the UCL north Observatory, Orbital Thresholds is inspired by the mechanical movement of the Orrery. 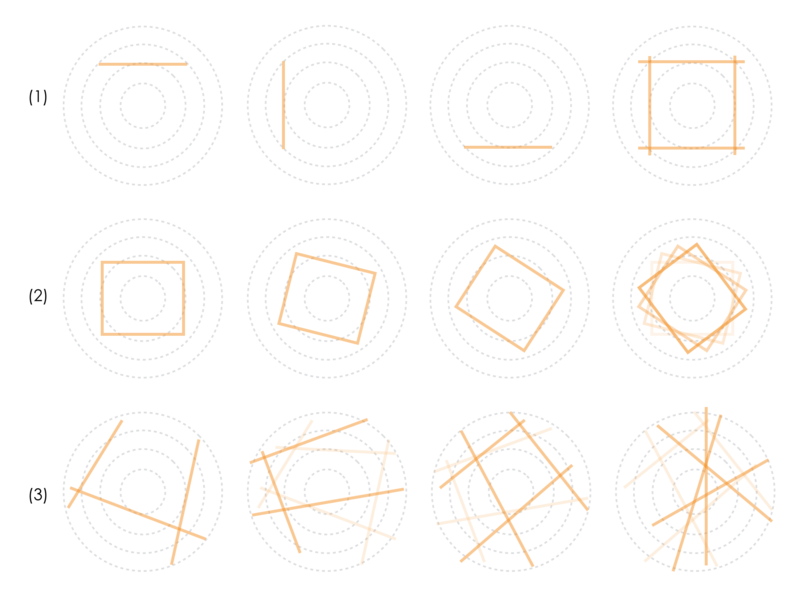 A tradition of exquisite kinetic models that describe astronomical orbits. A fascination with the science of visual spatial-perception has led the team to consider how projection can give the illusion of spatial transformation through light alone. 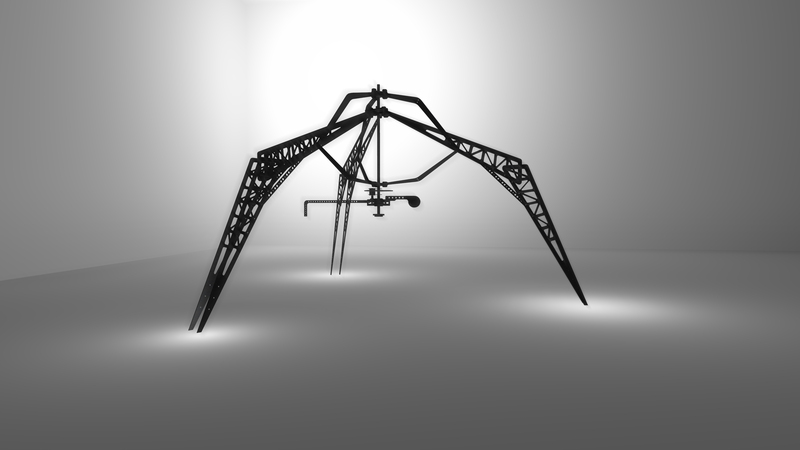 A multi-axis rotating mechanism constantly manipulates a reconfiguring projection system. Occupant behaviour is tracked and activates the motion of the system’s projection arms. Animated lines-or-shapes projected from the onboard lasers encourages participant interaction and spatial negotiation. The public are invited to visit and explore through interaction, by how light shapes the boundaries between virtual and visual space. How can people feel ownership and agency within a space, creating a transformative environment that responds to their paths of motion and gestures? Starting from the questions, the aim of Orbital Thresholds is to create a spatial experience from intangible space with laser projection. We will also explore how people relate to one another in these spaces. Using lasers, real-time tracking technology, a bespoke structure in the UCL observatory is being developed. People tracking tech is used to trigger intrractions between the virtual and physical. Fig1. The site survey: UCL Observatory. 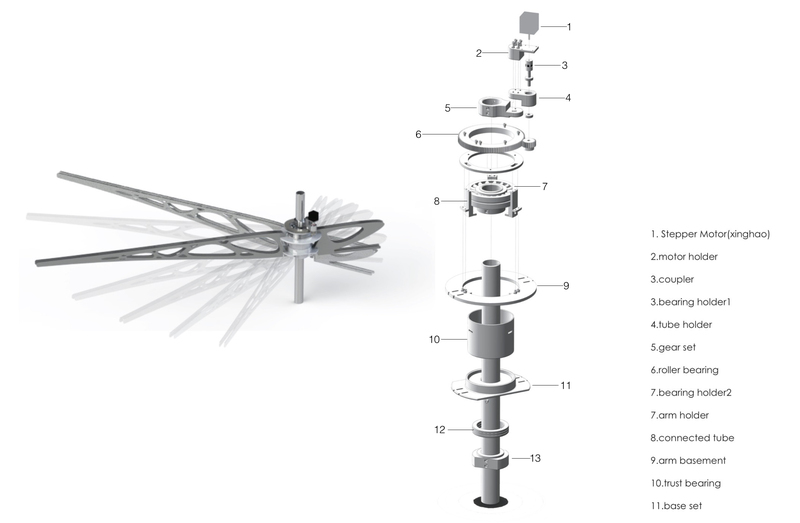 Version1: These figures shown below are the first prototype of the mechanism design of the interactive installation “Orbital thresholds”. The structure is fixed in the observatory ceiling. When participants move in the observatory, virtual walls and different patterns can be created by the ‘wall maker’ according to participants’ movements and behavior. Fig6. Parts of prototype 01. 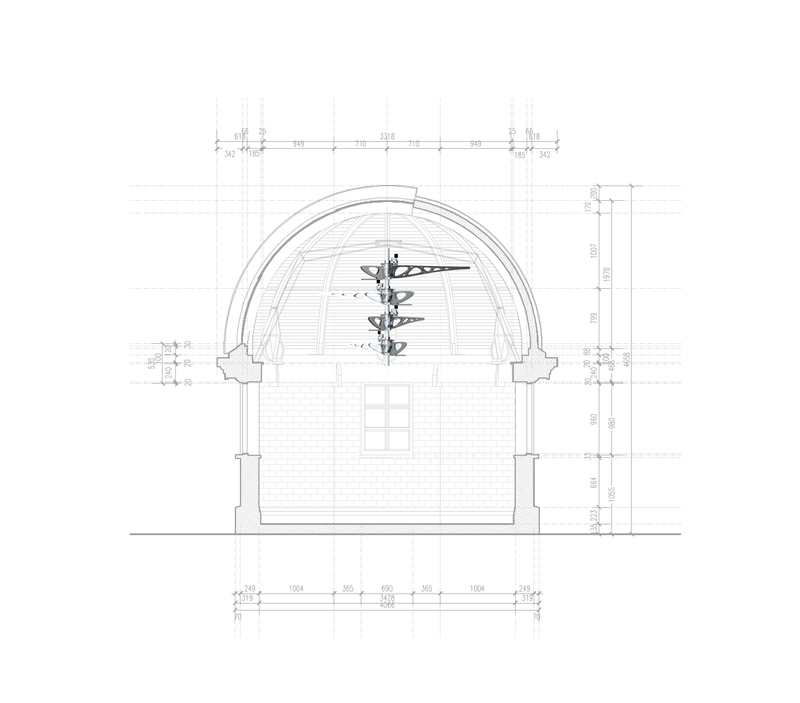 The prototype is made following the shape of the observatory which is circular. The mechanism of orrery is applied to move each part that holds the laser pointer, galvanometer motor, detecting camera is fixed in the bottom part. Fig7. Generating virtual wall and pattern. The illustration show the sequences of how the wall maker works. The rotation is the trigger and mechanism from the galvanometer motor are the key in transforming point into surface. With the help of fog machine, the virtual wall can be seen and give experience to people. Fig9. The effects of dynamic projected lines. Fig10. Possibility of cutting space with projecting lines. Fig11. The effects photos in scenario. In Figure 11, the axonometrical drawing of the core rotating part is analysed. 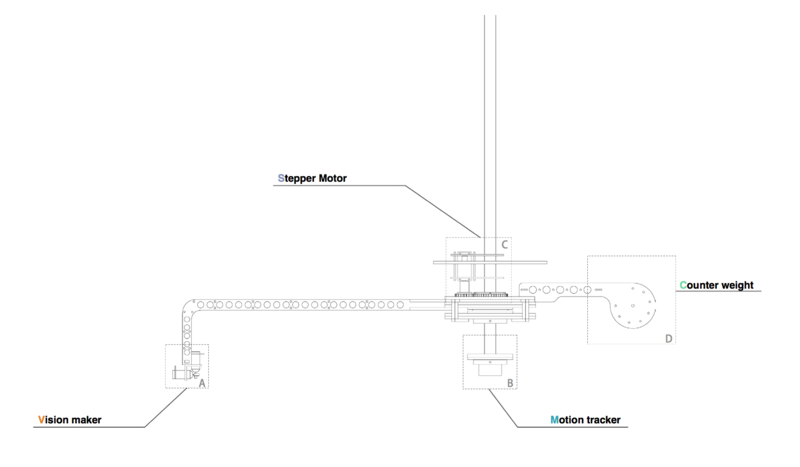 One arm is driven by one stepper motor. Its function is to let the arm rotate clockwise and anticlockwise. In order to ensure that the arm can be balanced and the rotating function can perform well, a spherical roller bearing (no.7) and a thrust bearing are used on the top and bottom of the rotating core part. Spherical roller bearings are self-aligning and are therefore insensitive to misalignment of the shaft relative to the housing and to shaft deflection or bending. At this point we need to reassure that the whole mechanism runs successfully and evenly. 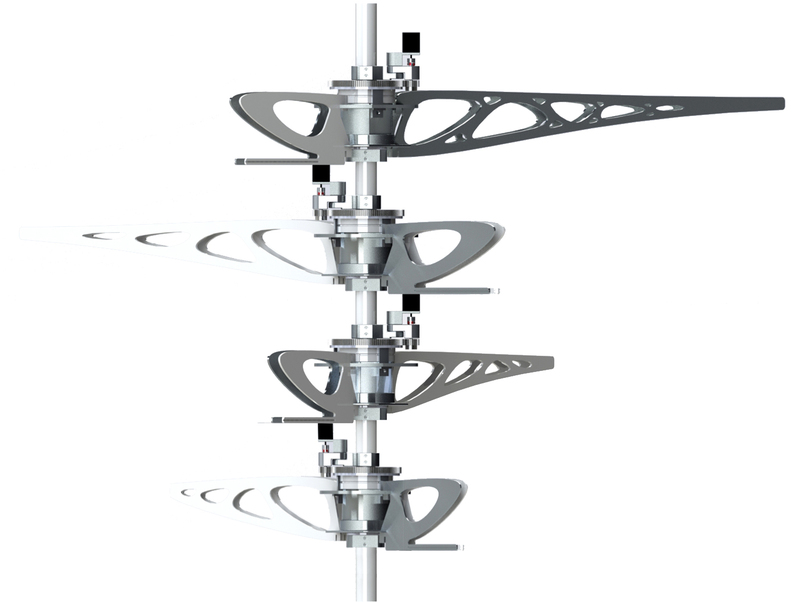 The mechanism of the design was simulated in Solidworks software. Fig12. Axonometric drawing of the core rotating part on the right side. One arm animation picture on the left side. Fig13. The joints detailed analysis. 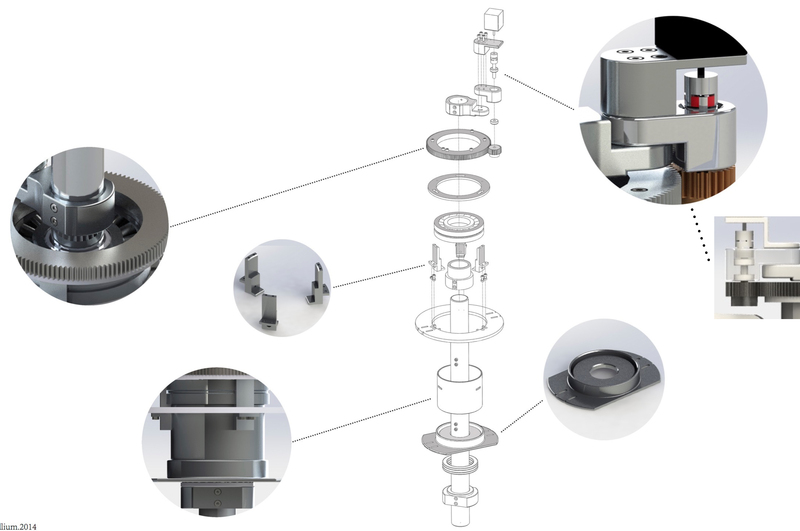 With the design of one single arm, the four multiple rotational axis arm was designed, as shown in Figure 13. Fig14. Four multiple rotational axis arm analysis. Fig15. The latest arm version with laser set. 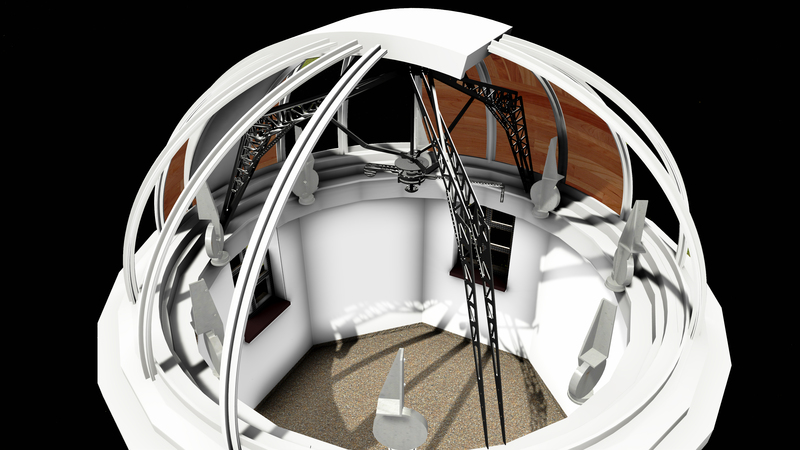 Finally, the overall installation is tested in the observatory, using a holding structure which stands on the dome part to firmly hold it (Figure 14). Fig15. The final installation onsite. Andersen, R. A. (1997). Neural mechanisms of visual motion perception in primates. Neuron, 18(6), 865-872. Arnheim, R. (1954). Art and visual perception. Univ of California Press. Brewster, D. (1830). Planetary machines. The Edinburgh Encyclopedia Vol, 16. Bradley, D. C., Maxwell, M., Andersen, R. A., Banks, M. S., & Shenoy, K. V. (1996). Mechanisms of heading perception in primate visual cortex.Science, 273(5281), 1544-1547. Cornsweet, T. 1970. Vi!oual Perception. New York, Academic Press. HAY, J. C. (1966). 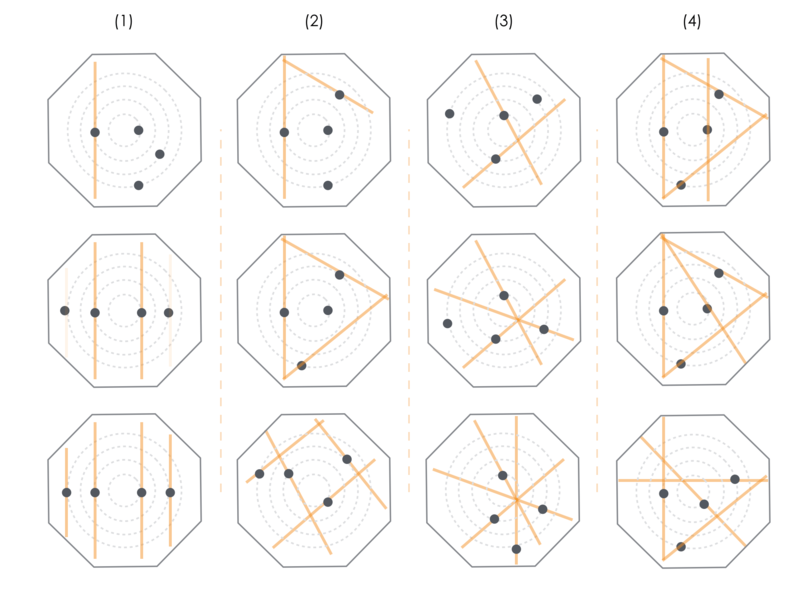 Optical motions and space perception: an extension of Gibson’s analysis. Psychological Review, 73(6), 550. Gage, S. A. (2006). The wonder of trivial machines. Systems Research and Behavioral Science, 23(6), 771-778. Gibson, J. J. (1950). The perception of the visual world. Gibson, J. J. (1957). Optical motions and transformations as stimuli for visual perception. Psychological Review, 64(5), 288. Goodale, M. A., & Milner, A. D. (1992). Separate visual pathways for perception and action. Trends in neurosciences, 15(1), 20-25. Humphreys, G. W., & Bruce, V. (1989). Visual cognition: Computational, experimental and neuropsychological perspectives. Psychology Press. Haque,U. (2007), Distinguishing concepts:Lexicons of interactive art and architecture. Johansson, G. (2013). Perception of Motion and Changing Form. Perceiving Events and Objects, 134. Johansson, G. (1975). Visual motion perception. Scientific American. Marr, D. (1976). Early processing of visual information. Philosophical Transactions of the Royal Society of London. B, Biological Sciences, 275(942), 483-519. Polyak, S. L. (1941). The retina. Ramachandran, V. S., & Anstis, S. M. (1986). The perception of apparent motion. Scientific American, 254(6), 102-109. Stevens, S. S. (1951). Handbook of experimental psychology. Spillmann, L., & Werner, J. S. (Eds.). (2012). Visual perception: The neurophysiological foundations. Elsevier.Ungerleider, L. G. (1982). Two cortical visual systems. Analysis of visual behavior, 549-586. Ullman, S. (1979). The interpretation of visual motion. Massachusetts Inst of Technology Pr. Wallach, H. (1959). The perception of motion. Scientific American, 201, 56-60.